JONATHAN COULTON: From The Pageant in St. Louis, this is ASK ME ANOTHER, NPR's hour of puzzles, word games and trivia. I'm Jonathan Coulton. Now here's your host, Ophira Eisenberg. Thank you, Jonathan. It's time to welcome our special guests. You've had their song "Daylight" stuck in your head for the last nine years. Their latest album is called "Almost Everyday." Please welcome Matt and Kim. EISENBERG: ...Of Art - Pratt Art Institute. What were you studying there, Kim? SCHIFINO: I went for illustration, and Matt went for film. EISENBERG: OK. And what came first, Matt and Kim the relationship or Matt and Kim the band? 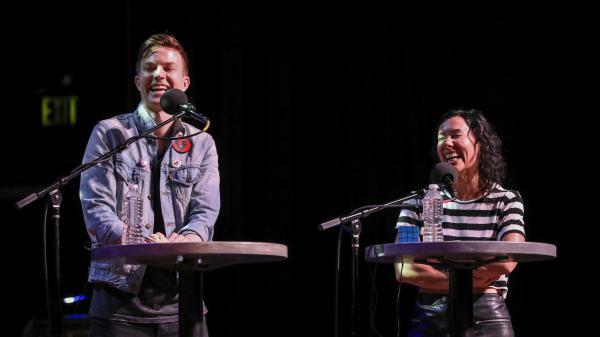 MATT JOHNSON: Matt and Kim, yeah, the doing it. That came first. SCHIFINO: And also, it was Kim and Matt. JOHNSON: Still, socially, we're Kim and Matt. SCHIFINO: So I was on campus. I was sitting on a bench with a friend, and Matt walked past. And I said, see that dude. I'm going to [expletive] out of him. JOHNSON: And my grandmother, in a very Helen Cook (ph) way, was like, it was a very nice story, honey. JOHNSON: The grandma way to say cool story, bro. SCHIFINO: Well, it's more of an accident. I went to a show, and I was watching the drummer. And I was, like, man, that looks fun. I want do that. So a friend gave me a hand-me-down set. And I was just kind of messing around in the bedroom. And Matt had this keyboard he wanted to figure out. So we were just kind of doing it - doing it together. EISENBERG: Yeah, there you go - high five. SCHIFINO: And then a friend forced us to play a show. And we kept being like, but we're not a band. And I don't know. It happened. JOHNSON: We had a really hard time coming up with a band name. And then they put us down as Matt and Kim. We're like, yeah, that works. Fine. Sure. EISENBERG: So your friend was, like, you are playing a real - this is a real gig. JOHNSON: ...Pretty real, let me tell you. SCHIFINO: Hey, New York City, that was a show. EISENBERG: Oh, my God. I did that show, like, yesterday. EISENBERG: And how did it go? SCHIFINO: People asked us to do more shows. So I think it went well. EISENBERG: Yeah, that's - I mean, so there it goes. So then you were just moving forward. You guys do these great videos. I feel like you mastered - there's a lot of creativity. I mean, clearly, illustrator, film - right? - the background comes into play. SCHIFINO: Hey, art school, you know, you got to use it for something, right? SCHIFINO: That was Matt, and I kept saying no. No way. Also, it was February in New York. SCHIFINO: It's really cold. Also, I kept my socks on 'cause it's New York. You don't want to run barefoot in New York City. JOHNSON: ...In Times Square in February. So who was taking the bigger risk? I don't know. SCHIFINO: Hey, I was on point, you know. I was good. EISENBERG: So 2017, you're playing a gig in Mexico. You jump out on stage, and you have a bad fall. JOHNSON: Kim tore an ACL on stage in Mexico. SCHIFINO: Yes. It's - same way I come out on the stage all the time - jump off the riser, lights hit, yeah. Someone moved a stage fan up. So I thought, in that second of coming down, I'm going to straddle it 'cause that's what you do. SCHIFINO: It was funny 'cause I didn't realize what happened, but it felt like my knee was on fire. And I was like, oh, sweet, we have pyro at this show. SCHIFINO: We can't usually afford that. SCHIFINO: ...'Cause, hey, we were there. We're going to do the show. JOHNSON: ...For all of that. Like, in the states, that would've been a fortune. EISENBERG: No, you're sunk. You're sunk. JOHNSON: I would've been - yeah, well, I mean, like, all right. SCHIFINO: So go to Mexico when you want to get hurt. EISENBERG: Your back touring. Have the shows changed a little bit? EISENBERG: Not all the time. EISENBERG: Good. I feel like you've learned a lesson. Well done, well done. So you - for the first time in a long time, because of your injury, you take time off from touring - almost a year. EISENBERG: Did it influence your recent album almost every day? JOHNSON: We make, you know, an upbeat music. JOHNSON: ...Everything like that. I just was not willing to write "Daylight" again. But I think it's one of the best things I've ever done - we've ever done. SCHIFINO: One more high-five (laughter). EISENBERG: We asked you what you'd like to play a game about. Matt, you told us you love nature. EISENBERG: Kim, you told us you fear nature. SCHIFINO: Fear it and hate it. EISENBERG: OK, so your game is called How To Go Outside And Not Die. EISENBERG: I'm going to ask you a multiple-choice question about how to survive in the world outside of your apartment. Ring in to answer. If you're wrong, your opponent can steal. You're going to play against each other. Quick disclaimer - these survival tips being presented are for entertainment purposes only. EISENBERG: Please consult someone who actually knows what they're talking about before going outdoors. EISENBERG: So according to the Storm Prediction Center at the National Oceanic and Atmospheric Administration, what should you do if you're in a car during a tornado? A - seek shelter under a bridge or overpass, B - get out of your car and lie down in an area lower than the level of the road, or C - get out your phone and go live because your followers are going to want this content, baby. SCHIFINO: You lay down in a ditch, which seems so dumb. EISENBERG: Yes, you are correct. EISENBERG: So you two actually encountered a tornado. SCHIFINO: Yeah, I learned the hard way. JOHNSON: So we were driving across whatever state is just east of Kansas, which I don't know. JOHNSON: I'm glad geography wasn't the topic. EISENBERG: So you're driving through Missouri. JOHNSON: We're driving through Missouri. JOHNSON: So finally, we see a gas station. Kim's like, pull over. Pull over. I've really got to pee. So we pull into this gas station, and the TV says there is a mile-wide tornado headed in this direction. SCHIFINO: At this point, I asked someone, so, like, is that big? SCHIFINO: They were not happy with that question. JOHNSON: You know, it's saying, do not try to go to your loved ones. Stay where you are. Stay in place. Be safe or whatever. We take a look around our surroundings, which is not only a gas station, but it is a fireworks warehouse, OK? SCHIFINO: Wait. But let me say nobody's on the highway. We were just cruising. JOHNSON: Clear sailing. No traffic. It was great. JOHNSON: At which point, it said, if you are listening to this broadcast and you're in a car, you should get out and lay in a ditch or something lower than the roadway. We thought, these people on the radio are insane. JOHNSON: That is the stupidest thing I've ever heard. EISENBERG: But that's what you did. JOHNSON: So we gunned it. We kept going. SCHIFINO: Hey, alive to tell the story, you know? EISENBERG: Which of these is a real safety tip from the National Park Service for dealing with bears on a hike? A - carry bags of coffee grounds in your pockets because bears hate the aroma, B - if you're attacked by a grizzly or brown bear, play dead. But if you're attacked by a black bear, do not play dead, C - dress the bear in a small, red T-shirt, so you can see its cute, little tummy. SCHIFINO: I love coffee, so I'm going to go with A - coffee grounds. EISENBERG: Interesting. I'm sorry. That is incorrect. According to the Seattle Zoo, coffee grounds are like catnip for bears. EISENBERG: All right, Matt, can you steal? JOHNSON: C seems not so likely, so I'm going to go with B - process of elimination. EISENBERG: Grizzly or brown bear, play dead. Black bear, don't play dead. You have to figure out what color the bear is. JOHNSON: But wait. What do you do? EISENBERG: You got to fight. You got to fight the bear. EISENBERG: OK. Let's say you're stranded outdoors, and you have to resort to eating bugs. According to Popular Mechanics, which of these characteristics means that a bug is more likely to be poisonous and, therefore, you should not use it has a snack? A - it's hairy or bright-colored, B - it's very loud or C - it has the ability to smile. EISENBERG: Yeah, man. That's correct. EISENBERG: If they're hairy, bright-colored, have more than six legs, they are probably poisonous. EISENBERG: Apparently crickets and grasshoppers are very tasty. JOHNSON: Have you tried one? EISENBERG: I would rather eat Popular Mechanics magazine. EISENBERG: So you guys were amazing. You did pretty well in that I feel like we learned a lot, too. EISENBERG: Technically, Matt won that round. SCHIFINO: I'll give it to you. EISENBERG: But, of course, you both won ASK ME ANOTHER Rubik's cubes because that's the whole point. EISENBERG: The best. Matt and Kim's latest album is called "Almost Everyday." Give it up for Matt and Kim.